Snow came early this year and pack trips were still on the program. We had the chance to ride out for a couple of months on a beautiful white cover, but even if the snow can be amazing for those who have never seen it before or don't usually see it, it can be traitor. The snow can cover the ground and totally hide it. When we ride in the summer we can see where we go and we are able to prevent accidents by telling guests to take their feet out of the stirups each time we see logs, rocks or mud. In the snow we don't see these obstacles, this is the first danger. The second danger is that the snow can also hide ice from a previous snow fall which started to melt. To avoid a risk of a slide and fall by the horses, we do several things. First of all we take off the shoes of the horses to make sure they are not goning to slide. Essentially, the metal of the shoes makes it easier for the horses to slide on the iced ground and gets the snow stuck under their hooves making them walk on a big piece of snow with each step. It would be like if you were walking on a tennis ball under your shoes! After making sure a good walking condition for your horse, we also have to give good instruction on riding to avoid you to be hurt from a bad fall. Even if our horses are surefooted, they are not superhero's. 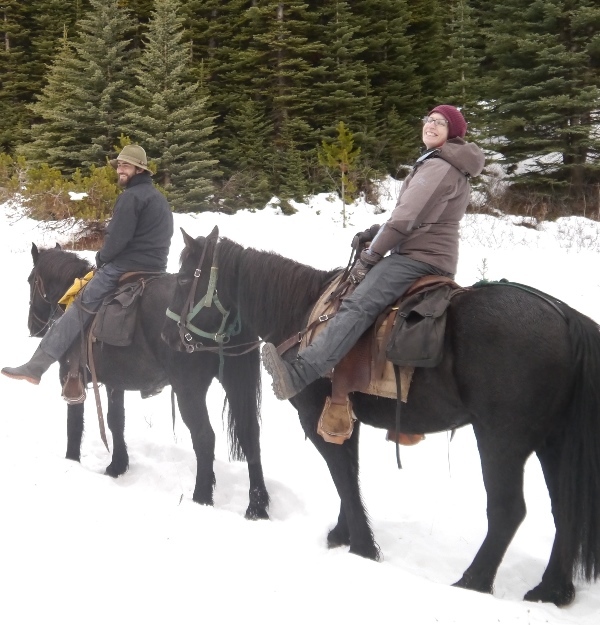 They can still slide and fall, but we can prevent the worst from happening riding with our feet out of the stirups at all times, being aware of the terrain as much as possible, walking down hill leading our horses by hand when the ground is too slippery or if there is too much snow. In every case we will make sure that we don't ride in the snow if it is higher than the belly of the horse, they don't swim very well in the snow! Just like you!